Jury Award on X International Theatre Festival “Voices of History” in Vologda (Russia). Cast: Nataliya Marczak (Ranevska Lubov Andriivna, landowner), Halyna Strychak/ Nataliya Lukashonok (Ania, her daughter), Volodymir Gelas / Yaroslav Fedoryshyn (Gaev Leonid Andriiovych, brother of Lubov Ranevska), Volodymyr Gubanov (Lopahin Yermolay Oleksiiovych, Merchant) , Yuriy Philipchuk (Trofimov Petro Serhiiovych, student) , Petro Mykytiuk (Firs, old footman) , Volodymir Chukhonkin (Symeonov-Pychyk Borys Borysovych, landowner), Tatiana Tkachenko (Scharlotta Ivanivna, governess), Taras Yurychko (Yasha, young footman), : Evgeniy Petrov, Sergiy Chygis /Lis Nazar, Yaroslav Korniychuk (Servants and Staff) . Confrontational, pompous, grand and compelling: Theatre Voskresinnia shows a spirited interpretation of the masterpiece The Cherry Orchard by Chekhov (1903). These artists takes audience on a journey to the time of the estates and the cherry orchards of early last century. A journey full of vanity, lust, wealth and glow, but also of decay, sorrow and sadness. The performance echoes the style of Chekhov and is both modern and actual. Each character wrestles, becomes ill, because of love or loneliness, but cannot be cured. The only thing that unites everybody is the cherry orchard, like a symbol of paradise and childhood. No life without the cherry orchard! The Cherry Orchard is a great performance full of fire and dynamic, inventive creations, impressive games, serene dramatic scenes and music. Come and see this classic theatre play converted into an intensely colourful show . The social-critical motif of this play is the change in values ​​in a bored and self-indulgent society. A topic that has not lost its relevance until today. The Ukrainian artists show us the extent of this drama, perhaps, only the tip of the iceberg, and yet the audience is already in the midst of the play of the vanities of the longings and the painful farewell of times past. The staging is on the one hand very much in the style of Chekhov and at the same time also very modern and up-to-date. The play is about 1900 on a Russian estate with a mansion surrounded by a beautiful cherry garden. Anja, the daughter of the landowner Ranjewskaja, brings her mother back from Paris, because the property is highly indebted and has to be auctioned. The mother had fled with her lover five years ago to France, after her little son had drowned in the nearby river. The brother of Ranievskaya, Gaev, was unable to deal with money and enjoyed life. Ranievskaya also spent her money in Paris. A salvation might be the former body of the family, the merchant Lopachin, who has come to a fortune. He proposes to build dachas on the property and rent them to summer guests. The brother of Ranievskaya, Gaev, was unable to deal with money and enjoyed life. Ranievskaya also spent her money in Paris. A salvation might be the former body of the family, the merchant Lopachin, who has come to a fortune. He proposes to build dachas on the property and rent them to summer guests. The prerequisite for this would be the clearing of the beautiful but useless cherry garden, which is just in full bloom. The cherry garden, which no longer yields any harvest, symbolizes the Russian nobility, which no longer benefits Russian society. It has only a decorative function, it symbolizes the beautiful. In the end he is cut down. The landlady retreats to Paris, all leaving the house, only the old servant Firs, who symbolizes the old time before the abolition of the physical condition, is accidentally trapped. …the presentation was one of the most shown at the festival. 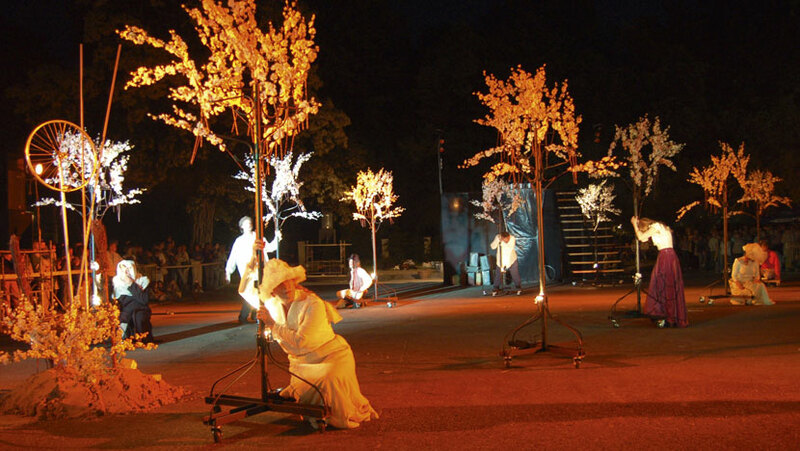 The director has focused primarily on the transfer of the image world of dreams and illusions Chekhov characters – hence the scene with the dancing puppets on stilts next to the dream of a happy childhood, the owner, walks in dressed in white and moving on stilts, people waiting on the thriving orchard, carefree fun commoners. The imaginary part of the reality of the estate was the most colorful residents, and the most interesting side show, which next to the value of the visual interpretation was valid. Chekhov boring world without hope of improving the situation of the bankrupt estate is turned into the world of memories, reckless and bordering on the insane fun main character Lyubov Raniewska, and other residents of Cherry Orchard. Tight program, many attractions. XXIV International Festival of Puppet Art in Bielsko Biala. (…) And at the end of the eventful day, on the Boleslav the Brave square appeared Lviv Theatre Voskresinnia giving the show called “The Cherry Orchard. ” In contrast to the presentation of the originals Chekhov shows there was not a shred of inactivity. The artists created a beautiful spectacle in visual terms. Their energy, despite the cold , warm audience gathered in the square. 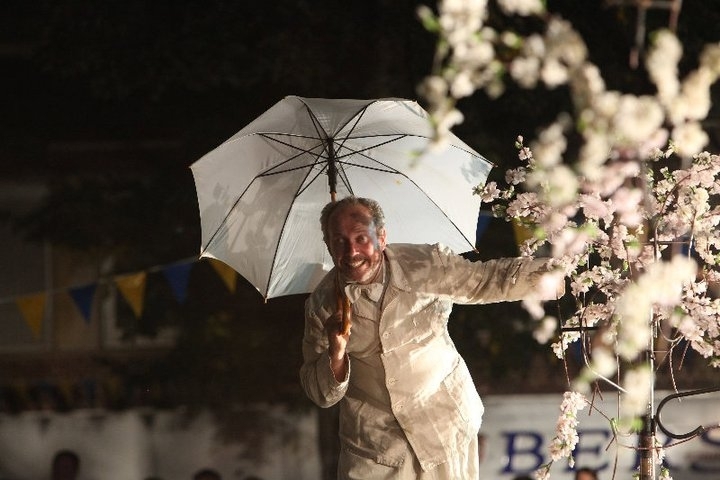 A stroll on stilts, with umbrellas in hand between the hangers imitation cherry tree was a memorable moment of the play. Anna Hazuka, Dziennik Teatralny Bielsko-Biała. 24 maja 2010. It’s hard to imagine a street full of nostalgia present “The Cherry Orchard,” but the theatre of Lviv, although presented mass spectacle, full of rushing the elements, has not lost the charm of Chekhov, by himself called comedy. Comedy is a bitter, marked by transience, so returning to the playground smacks funeral, because the hatchet after the final – the sale of the orchard – hangs in the air. Internal unrest calm you are not imported into the province, the sounds of Italian tarantella, polka galopki Vienna, the Argentine tango. And when the ax finally falls, this will be the Wagner “Die Walkure canter,” and devoid of trees flowers (including hangers, chandeliers, hand) as a blush. In light of the fire rush to the square cars, bikes, scooters, shooting fireworks into the sky and the bells are rung. And the spirit of Chekhov is still in the present. How to translate classic scene to the language of the street? On this question, the answer – Voskresinnia from Lviv gave today, in the second day of the XXVIII International Festival of Street Theatre Theatre , a comedy of Chekhov’s” Cherry Orchard “interpreted in the space of Town Hall Square. Is the translation has gone? “The Cherry Orchard” is next to the “Three Sisters” one of the most emblematic works of Russian playwright. Who does not know the works of the classical form, does not know the exact content watching the street version. Spectator “unprepared,” and this is usually the recipient of a statistical piece of street theatre, the representation of perceiving a number of associations and a lot of colorful images of beautiful spots built by Ukrainians in the vision of the work of Russian classics. who at the gladiator march lugging buckets of water, and later – with his antagonist, competes in the sit down on a board with nails . But this paradise will soon be over, and inform the multilanguage message that the August 22 Cherry Orchard – us treat this as a proper name – will be sold. That message sounds like the announcement at a crowded train overheard the age megaphones, is repeated several times. In the end user changes the owner who destroys it. This is accompanied by Russian sadness coupled with an acute drinking, which turns everything into a game, despite destination.The Performance by Voskresinnia is a great metaphor of paradise lost and the eternal quest for happiness is still fleeing. Shown in a convincing and colorful way. Expressive playing actors, actresses especially reproducing the main character. Girl with a disability as well hide your weakness that you can see it only if, after the applause leaves the scene. In “The Cherry Paradise” is a lot of props. Maybe a little too much “is also an interesting soundtrack. Unfortunately, it happens sometimes the quality of “telephone.” Who knows? Why not just meant to be? However, by the (d) effect of some of the messages sound like gibberish. Despite these shortcomings hours devoted to art is certainly not time wasted. And it’s hard not to have the impression that at both the technical and mental, “The Cherry Orchard” is one of the best presentations in the history of the Festival. XI International theatre festival “Melihovska Vesna”. Ministry of Culture of Russia, Ministry of Culture of Moscow Region.Theatre Union of Russia , State Literary-Memorial museum of A. P. Chekhov. 15 -22 May 2010. Cherry Orchard is on fire. This is considered to be violence, danger, something unavoidable. A rumble from the sky, the sound, duration and outbreaks of fire …. And helpless, restlessly people with the last remnants of the weak forces are trying to save what can not be saved. Departure made as emigration, which condemns to affection forever. Handbags, suitcases are lowered from the high podium to the ground, but they are unlink. Everyone scene is burdened sense, justified the existence of high voltage actor. Actors work – one better than another. We see a formula-play synopsis, imaginative play with patience, with life, with fate.